Each of our teeth contains a long, thin strand of dental pulp—soft tissue inside the tooth containing blood vessels, connective tissue and nerves which provides the tooth with nutrients and nerves—that extends down to the tooth’s root. If the pulp becomes infected or injured, the tooth’s nerves die and, often, without endodontic treatment, the tooth dies as well. Patients who have pulpal nerve damage often times report symptoms such as pain when biting down or chewing food, over-sensitivity to hot or cold beverages and facial swelling. 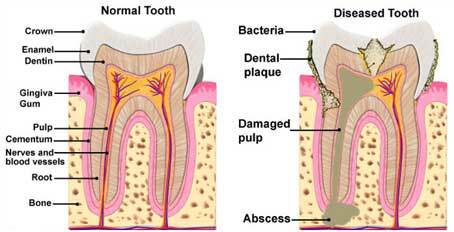 This damage is usually due to aggressive tooth decay that results in infection or trauma. If left untreated, the infection will spread to the bone surrounding the tooth and rendering it unable to hold the tooth in place. Treatment involves removing the affected pulpal area and fabricating a replacement crown. The procedure is usually spread across several visits. During the procedure (performed under anesthesia), an opening is drilled into the tooth’s crown and pulp chamber, diseased pulp is removed and the canal reshaped and filled. Then the tooth is permanently sealed with a gold, porcelain, or tooth-colored crown. Here at Summit Smiles we provide complete root canal treatments, contact us today to find out more.